Five-time IMSA WeatherTech SportsCar Championship Prototype Challenge champions CORE Autosport have finalized their driver lineup for the 2016 season. Jon Bennett and Colin Braun will continue to drive the No. 54 Composite Resources/Flex Box ORECA FLM09 with Mark Wilkins joining the pair for the Tequila Patrón North American Endurance Cup races. 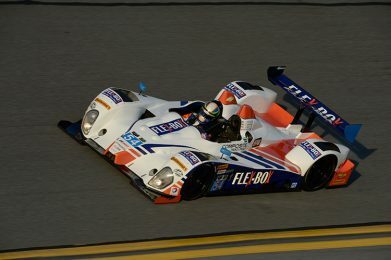 Martin Plowman rounds out the team’s roster for the Rolex 24 at Daytona. Bennett and Braun are now on their fifth season together as co-drivers and will be after their third-straight Prototype Challenge drivers’ championship. Since first pairing up for the 2012 American Le Mans Series season, the two have amassed 11 class wins together. Wilkins has served as a support driver for CORE since 2012 and was part of the lineup that won the Rolex 24 at Daytona in 2014. In addition to the Rolex 24, he will re-join Bennett and Braun at the three other rounds of the TPNAEC: Sebring, Watkins Glen and Petit Le Mans. Plowman is new to CORE Autosport, but not new to prototype racing. He’s driven with BAR1 Motorsports in 2014 and 2015, including last year’s Rolex 24. He also has two successful seasons of LMP2 racing under his belt, including a WEC LMP2 Championship in 2013 and a class win at the 24 Hours of Le Mans that same year. Another change in the CORE lineup includes Jeff Braun as race engineer. Braun brings more than three decades of motorsports engineering to the table and numerous championships. Working with CORE gives Braun the opportunity to work closely with son Colin.